"List-group-label is a form of semantic mapping. The strategy encourages students to improve their vocabulary and categorization skills and learn to organize concepts." (Reading Rockets, 2015). The first step, list, is when the class brainstorms ideas that deal with a large topic. The next step is group. During grouping, students take their listed ideas and group them into certain categories. After students have come up with all of their categories, they label the groups into categories. When students make connections between the topics they are reading, they will comprehend the text better. List-Group-Label is known to improve existing vocabulary and organize verbal concepts for students. This strategy was developed to assist students in remembering, categorizing, and organizing specific terms to a content area. According to Boling and Evans, using list-group-label increases students remember their vocabulary to a specialized content area such as language arts, math, science, and social studies (Boling and Evans, 2008). This strategy is proven to be effective in vocabulary development and lead to literacy skills. 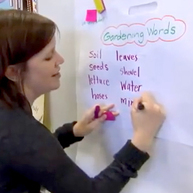 "Students need to connect familiar words with new words, expanding their conceptual understanding of vocabulary. Then, during and after reading, they revisit their categories to expand and make changes." (Miller, Veatch, 2011). Some students have learning disability such as memories, vocabulary, language, communication, and so one. For student who struggle with one of these examples the List-Group-Label would allow them to conceptually see and be hands on in their learn to add an additional support. Struggling readers will benefit from a list-group-label lesson because they will be activating their prior knowledge and learning how certain topics connect. This will give these students a chance to brainstorm their ideas, group their ideas with similarities, and then go through and then label them with the connections that they made. "Students need to connect familiar words with new words, expanding their conceptual understanding of vocabulary. Then, during and after reading, they revisit their categories to expand and make changes." (Miller, Veatch, 2011). "By revisiting during and after reading, the teacher can ensure that students are learning the word meaning that is connected to the area of study." (Miller, Veatch, 2011). 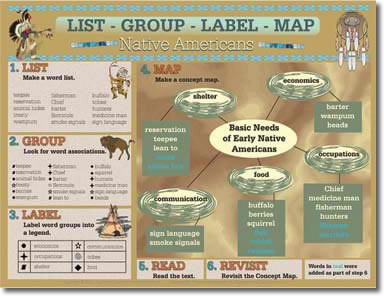 Social Studies: When discussing cultures or geography, a list-group-label lesson will help students connect to the material. They can list different attractions, movement, regions, human/environment, places, and location. Once they have their list of things, they can group them into whatever categories they want. There will be various ways that students can group the items listed. Once their groups are done, they will be able to categorize them. Boling, C. J., & Evans, W. H. (2008). Reading success in the secondary classroom. Heldref Publications. ​List-Group-Label. (2015). [image]. Retrieved from http://www.readingrockets.org/strategies. ​List-Group-Label. (2015). [web video]. Retrieved from http://www.readingrockets.org/strategies. Miller, M., & Veatch, N. (2011). Literacy in Context (LinC): Choosing Instructional Strategies to Teach Reading in Content Areas for Students. Grades 5-12. Pearson. Montgomery, M. (2013, December 4). List-Group-Label. Retrieved September 26, 2015. ​Readence, J. (n.d.). List-Group-Label: A Simple Strategy for Improving Vocabulary and Activating Prior Knowledge. Retrieved September 26, 2015.